The road authorities of Bavaria / Germany requested a Glint and Glare Study for a planned photovoltaic power plant next to the A3 Autobahn. The assessment had to evaluate the potential Solar Panel Glare from the PV-plant toward vehicles driving on the highway in both directions. Given that the highway's guard rails hide part of the installation, one could believe reflections to be shielded off anyways, but for the higher seated truck and bus drivers the PV installations still would be fully visible and thus a potential source of Solar Panel Reflection. 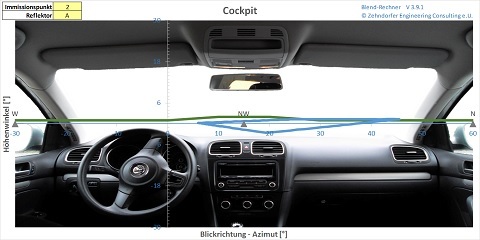 The Glare Assessment was evaluated based on German Light-Guideline (Licht-Leitlinie), which defines the methods for evaluation and respective thresholds for glaring. In this regulation only specular reflections are considered - not scattered light-rays, that might occur on structured glass surfaces. Reflections are only seen as relevant, if they are lie more than 10° off the position of the sun. Additionally the deviation from the line of vision of the driver, who keeps his eyes on the road, is a relevant factor. Drivers, who follow the road, must not be dazzled by reflections in a way, that cause them to lose control over their vehicle. The client offered two possible orientations for the PV panels - exactly towards the south and parallel to the highway running from the northwest to the southeast. The glare assessment was done for both variations. Based on the very low glaring potential, the decision was taken to submit the south-oriented PV-plant for the building permit, since it will yield roughly 5% higher energy production.